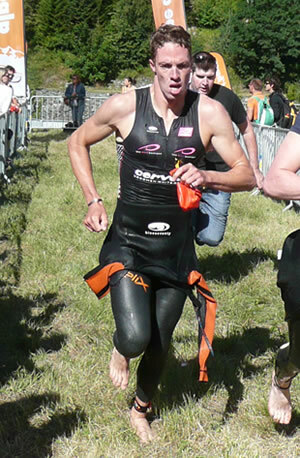 South African James Cunnama is just 27 years old, and starting to make his name known in the long distance triathlon scene. 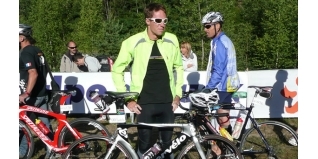 2009 was a breakthrough season for the likeable teamTBB athlete, highlighted by a second placed finish at Ironman Austria. On Wednesday James achieved his first major professional victory at the Alpe d'Huez Long Course Triathlon, and I spoke to him at the finish line. (Check out the race report HERE, and image gallery HERE). JL: James, congratulations - you told me when we spoke before the start of the race that you wanted to improve on your third place last year. You did that, you must be very happy? JC: I'm ecstatic - everything just went fantastic today. The swim was not great initially, it was very cold and to start with I battled to get my breath, but once I warmed up I got into it. Onto the bike, I just felt sublime the who way. Up the first hill I was hardly working at all, and staying with the guys and that is when I knew I had the legs today, and for the rest of the ride they just flowed. Even on to the the run at 1800m, I thought it was going to be tough but I felt strong the whole way. I'm very very ecstatic with my run, it bodes well for the rest of the season. JL: You came over the top of the second climb (Col d'Ornon) together with Bertrand Biland (FRA), but by the top of Alpe d'Huez you had a massive lead. Did you really put the hammer down on the climb, or was it in the transition between? JC: I kind of pulled up to him on the climb and sat behind for a little bit. I knew that was the lead and I didn't want to push too hard too early, but going down the other side of the hill, on a time trial bike - the other guys were on road bikes - I just opened up and pushed the limits and went down the hill hard. I knew that was where my advantage was and I got to the bottom of Alpe d'Huez, knew I had a bit of a lead and I just kept the pressure up all the way to the top and once I was at the top in the lead I was pretty sure it was mine. JL: How much fun is it do do a race where basically you have three odd distances, no qualifying, no records - it's back to how triathlon was, on a magnificent course and all you have to do is just race the athletes? JC: Yes, it certainly takes it back to the roots. There is no pressure, no expectations on time or anything - it's just mano-a-mano really - you just race against the course and your competitors. It really gives you the freedom to push when you feel good, go easy when you feel bad and opens it up to the strongest competitor on the day rather than opening it up to tactics. JL: You raced on a time trial bike (Cervélo P3), do you think there is any benefit either way or is that just your preference? JC: You know, people question racing on a TT bike on a race like Alpe d'Huez - I live on my TT bike. I race on it, I ride on it day in and day out, it is what my legs and body are used to. I descend well on it, climb well on it. I don't think it makes a massive difference - your body will get used to whatever you are used to riding, and as I've shown today, it's certainly not slower! JL: Congratulations again James, and have a great rest of season.